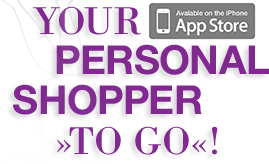 With our "CityShopperApp" you will discover the fashion scene of your city in a new style. It’s goal is to show you not only the most beautiful shops, but rather provides you a tool that filters the amazing variety of shops by your personalized needs and creates a guided tour for you. 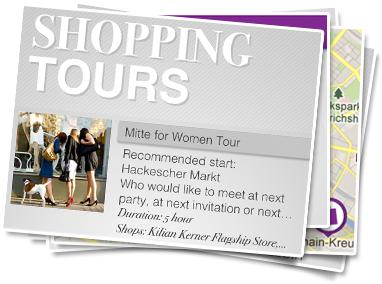 Or you explore the fashion scene of the districts with one of the theme tours rranged by the fashion pro’s from Berlin Shopper - inclusive sightseeing and restaurant recommendations. The app will keep you up to date with the newest events in the fashion scene, gives you trend information – with matching theme tours. We’re starting with the new fashion metropolis Berlin. Discover with different theme tours like Vintage- , Eco Fashion-, Designer tours and many more the diversity of the fashion scene of your city and let you take along a little fashion adventure. 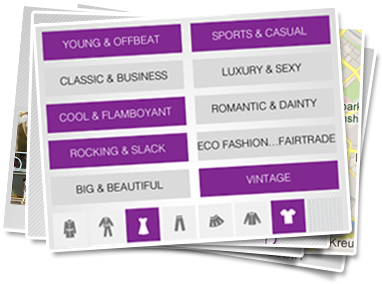 On the hunt for anything in particular or you have only less time, create your own personalized shopping tour – by your style, budget, time and the products you are looking for. In the shop register you can have a look at all shops. You can filter them by different aspects like near-by, A-Z etc. 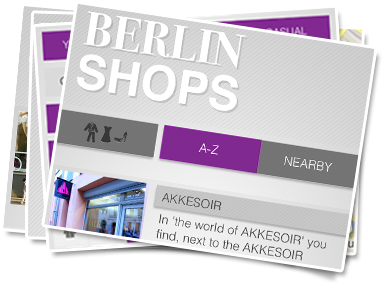 In the detail view you find extensive information and pictures from every single shop. By GPS-function you will be guided to one shop after another in the map view. 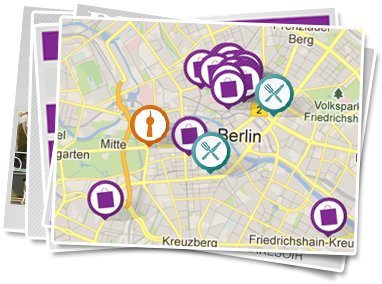 You can discover sightseeing hot spots and restaurants recommendations on your way. 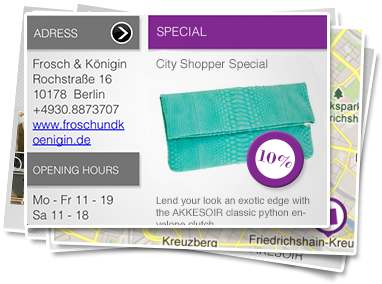 With CityShopperApp you can profit from special offers and actions in many shops after the check- in. 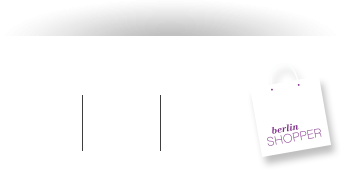 The "check – in" appears, while you enter a shop on your tour. Just press check-in and save your benefits! Stay up to date with CityShopperApp. Read in the news, what is happening in the fashion city, what are the newest fashion trends and let pick you up on a matching trend-theme tour.